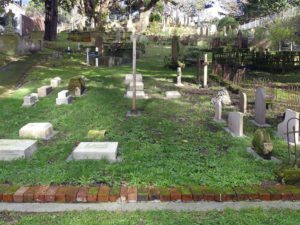 You might think an old cemetery should be a place of peace and tranquility, but land is scarce in Wellington and if anything looks a bit derelict it tends to get redeveloped. 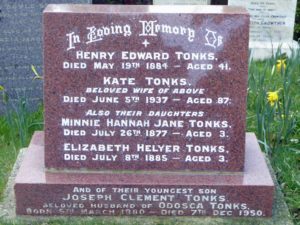 Bolton Street Cemetery has always suffered from being too close to the town centre, but the biggest disruption it suffered was in the 1960s when the urban motorway smashed through the grottier bits of Thorndon and split the cemetery into two halves. 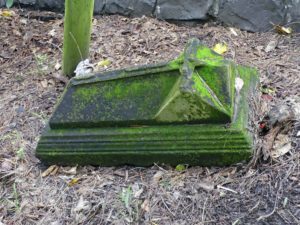 These days we all bewail the ‘destruction’ of the cemetery, but like many inner-London graveyards it had long been in a sorry state: it’s probably tidier now than it ever was for most of the 20th century. 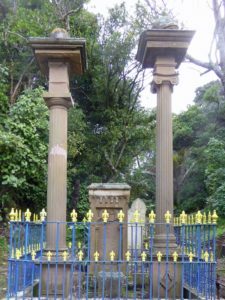 A preservation society keeps it up to scratch, and it offers a pleasant afternoon’s tour round the rich and famous (and dead) of Wellington. 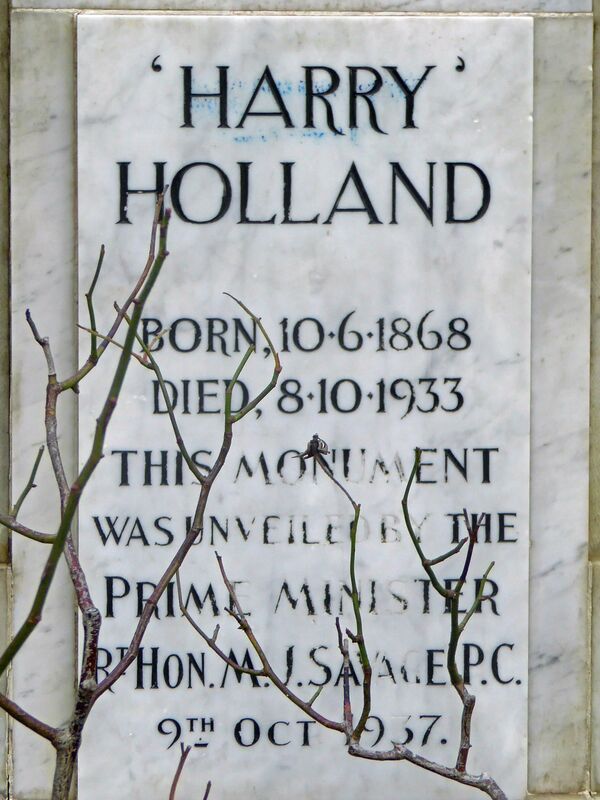 Seddon was Prime Minister from 1893 and died in office. 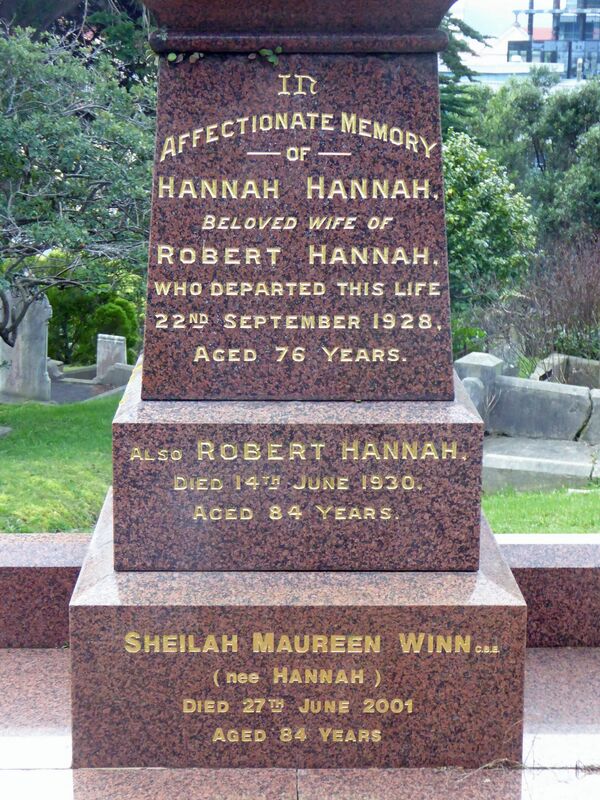 He arrived from England via Australia in 1866, working as a storekeeper and a gold miner. 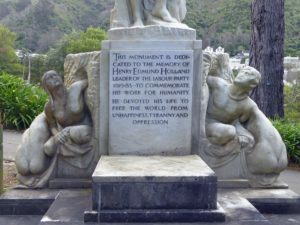 His government made many social reforms including giving women the vote in 1893 – New Zealand being the first country in the world to do so. 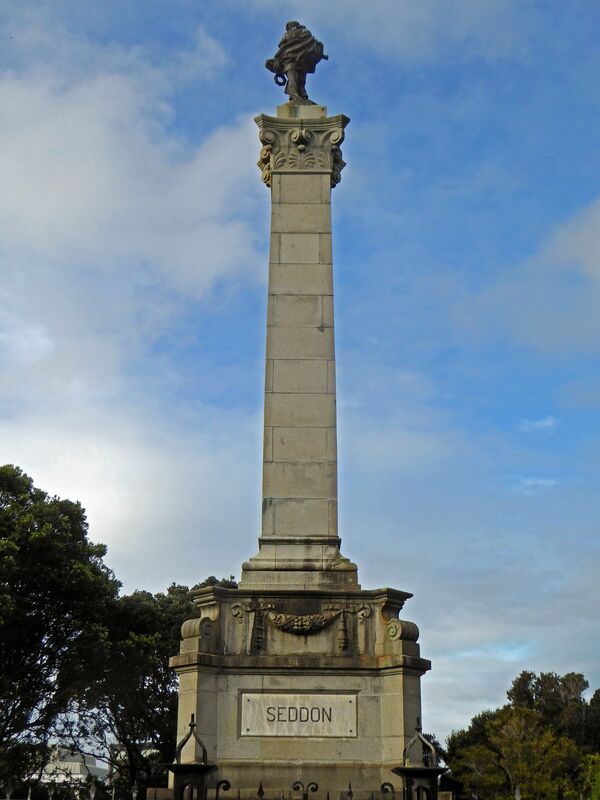 Wellington’s first time-keeping observatory was relocated to make way for his tomb. 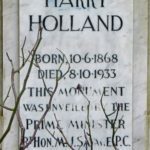 Originally Australian (that would explain the bare bottom), Harry was a printer by trade who became leader of the New Zealand Labour Party from 1918–1933. 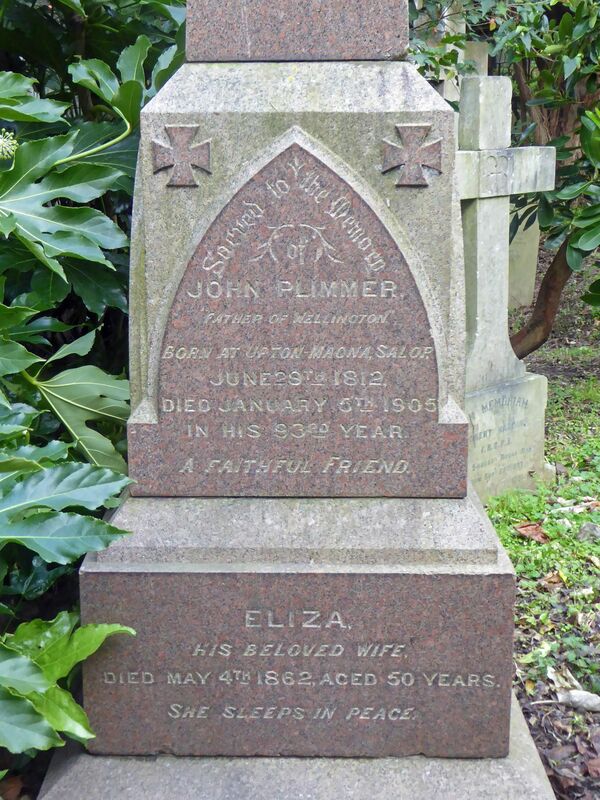 He died while attending King Mahuta’s funeral. 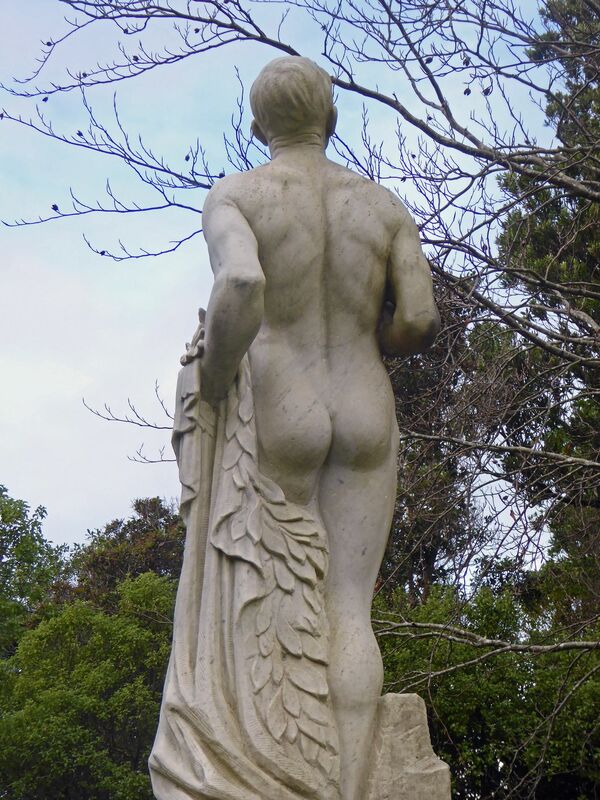 He wanted to be buried on a windswept cliff and at that time his tomb would have had unobstructed views over Wellington City (and the city of him, presumably.) 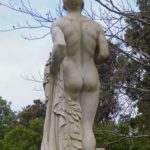 The very striking sculpture of idealised figures was carved from Carrara marble by Richard Gross, who also designed the sculptures on the Wellington Cenotaph. 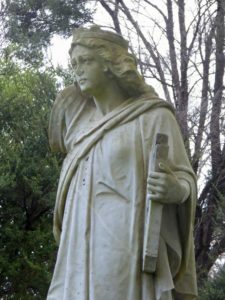 Rather a nice figure of Liberty, though looking rather troubled – perhaps because she lost her right arm when she was relocated for the motorway. 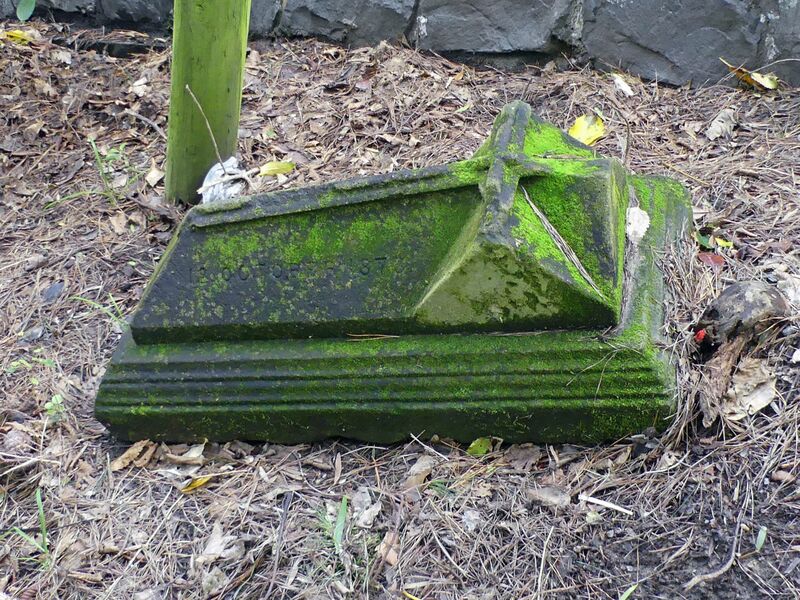 The lawn is the part of the Jewish Cemetery that was still vacant when the combined cemetery was closed in 1892. In addition to importing boots, Lipman was one of the earliest members of the Wellington Philosophical Society. 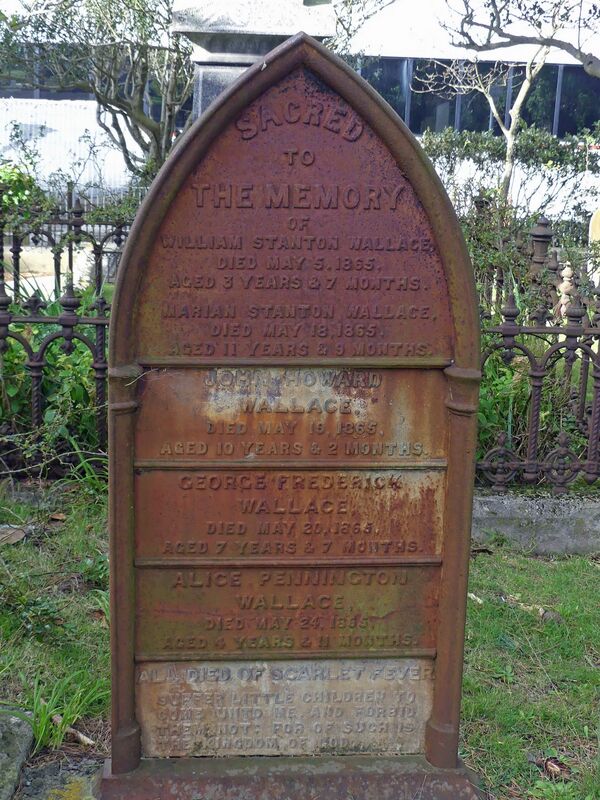 He was also involved in Wellington’s gold rush of the 1860s, opening a mine at south Makara. Lipman Street and Levy Street on Mt Victoria mark the site of his large house and garden. 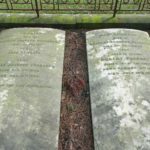 When Selig was appointed Reader and Shohet (ritual slaughterer for kosher meat) in 1862, the Jewish community numbered fewer than 50 – not enough for him to make a living, so he took up watchmaking which soon crowded out the religious duties. 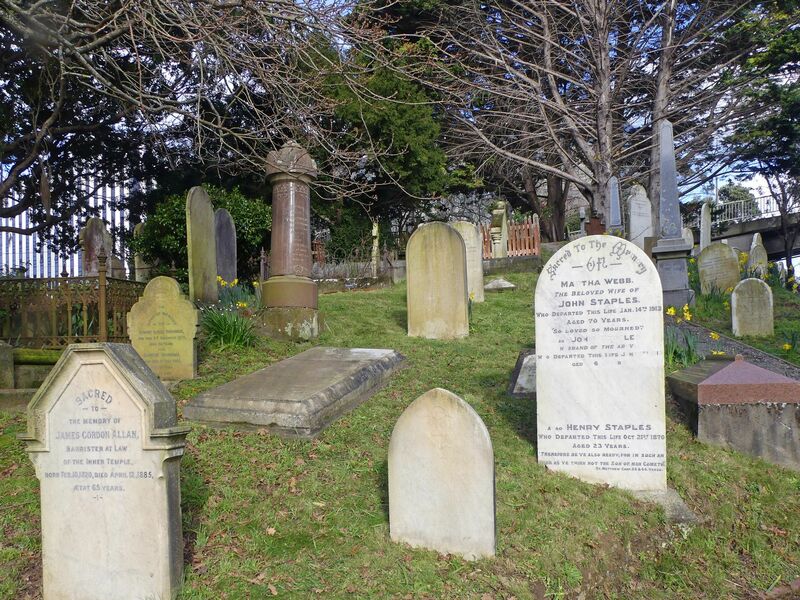 The view includes colonial houses that were built around the same time as the cemetery. 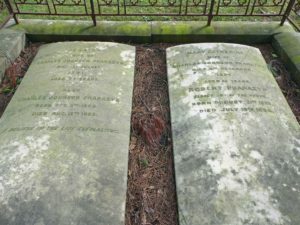 A brick outline is all that is left of the home of the Public Cemetery’s sexton. 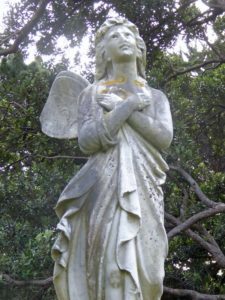 This is one of only two angel statues in the cemetery and was erected for the three children the MacDonalds lost to scarlet fever within one month. Frances was prominent in the Women’s Social and Political League in the 1890s. 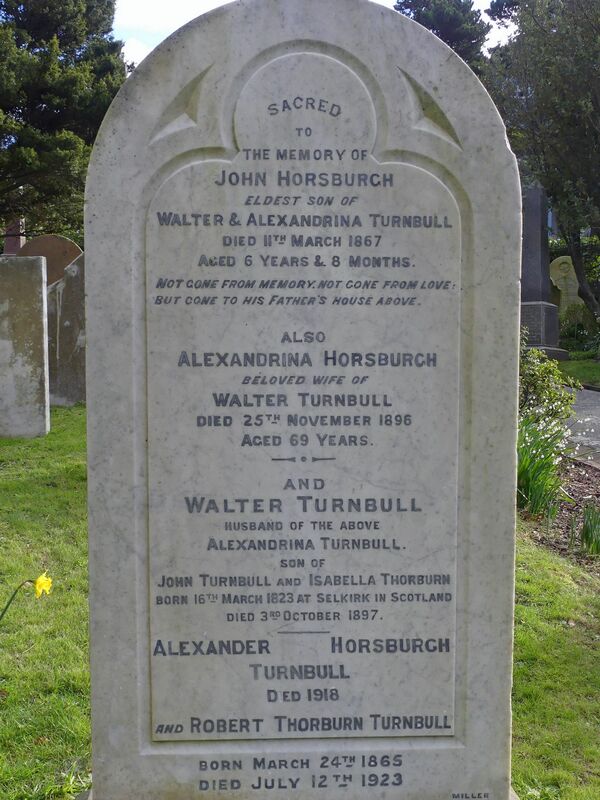 They lived in Inverlochy House and Somerled House. 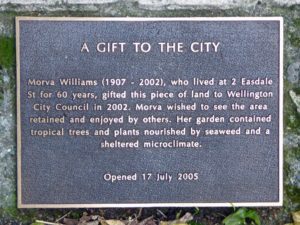 Many Wellingtonians will recall the large department store first known as Te Aro House and later as James Smiths. The store closed in 1993 after 126 years of trading. 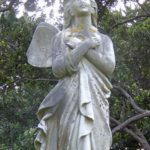 This magnificent marble cross is the second biggest monument in the cemetery. 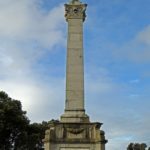 Thomas Waters arrived in 1841 with a prefabricated store from Sydney, which was erected on Lambton Beach. 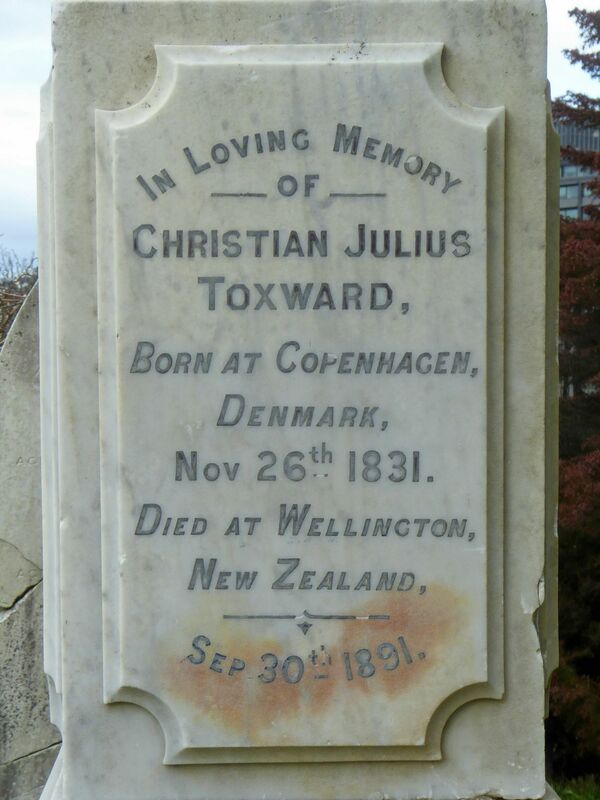 A Danish architect, Toxward designed many imposing Wellington buildings but few remain. After the 1848 earthquake damaged brick buildings, Toxward designed wooden buildings that looked like stone. A nearby example is 22 The Terrace at the foot of Bolton Street. 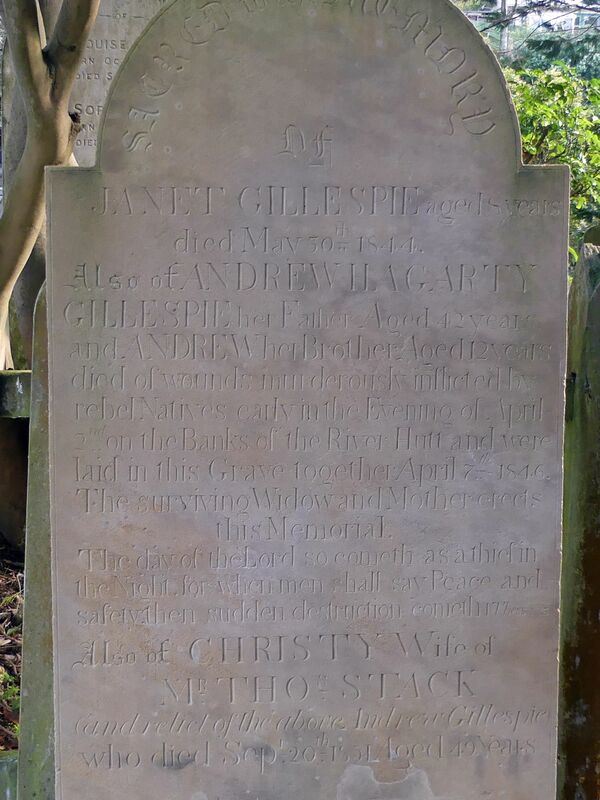 Other work includes the former St Mary’s Church in Hill Street and extensions to Old St Paul’s. 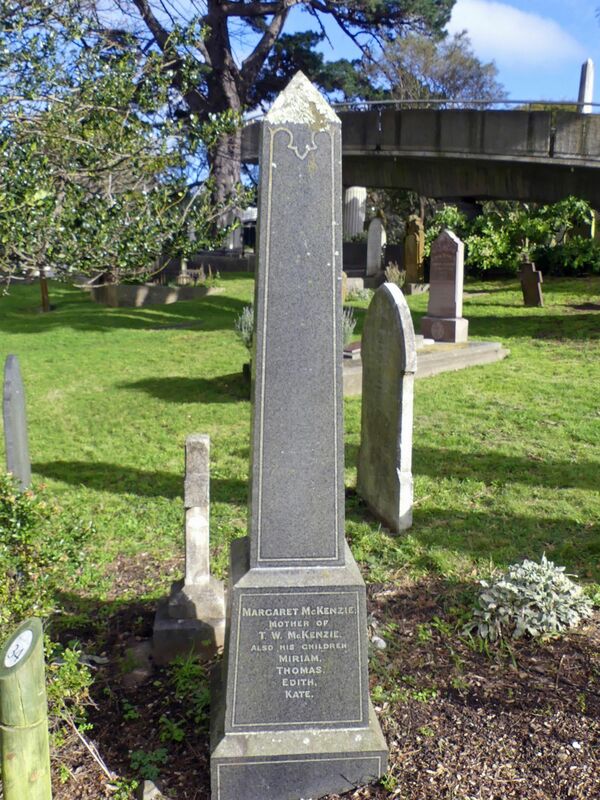 Robert was an Irishman who came to New Zealand in 1864, aged 18. 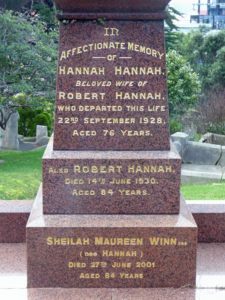 He set up a footwear business in Hokitika during the goldrush and later moved to Wellington, opening a chain of shoe stores through the North Island. 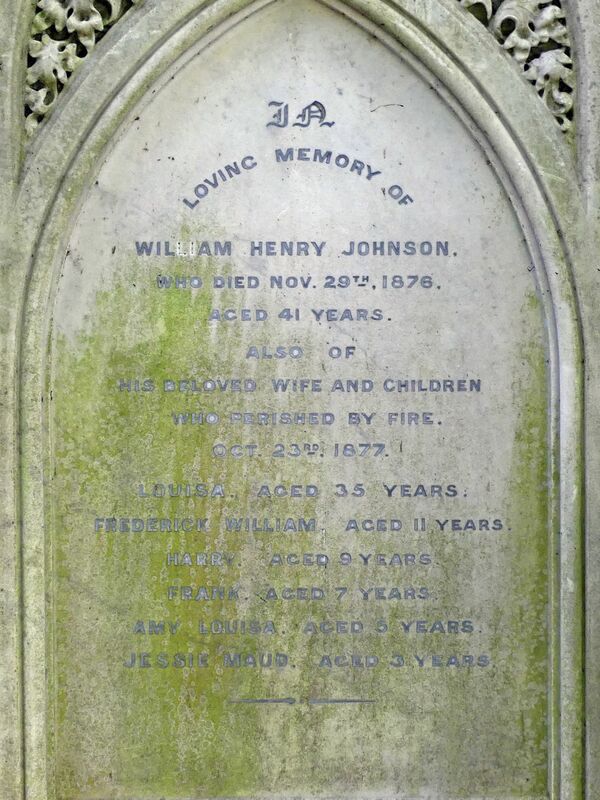 The couple had eight children and lived in Antrim House in Boulcott Street. 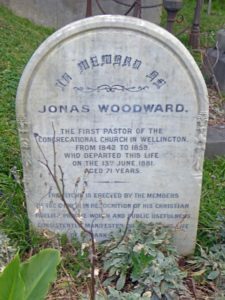 Woodward Street was named after Jonas, who was the first trustee of the Public Trust Office, an unpaid pastor, trustee of the Public Cemetery, a businessman and an educationalist. 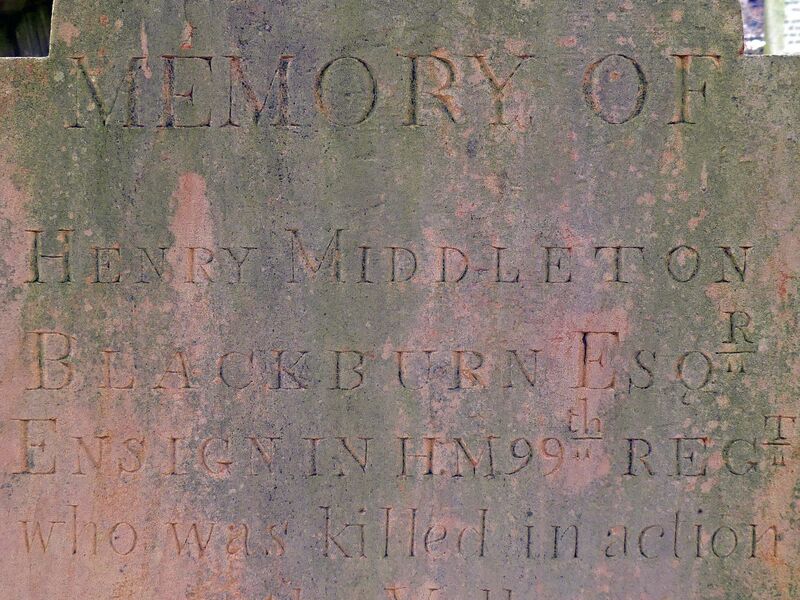 His plain memorial contrasts with the adjacent elegant carving on the Doull headstone. 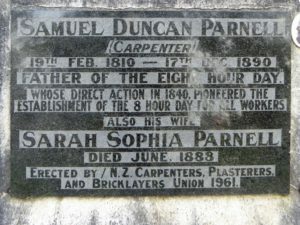 Parnell is credited with creating the eight-hour working day. Arriving from England in 1840 where working days were far longer, he caused a stir when, contracted by a fellow passenger to build a store, he insisted that his days should be eight hours work, eight hours sleep and eight hours relaxation. 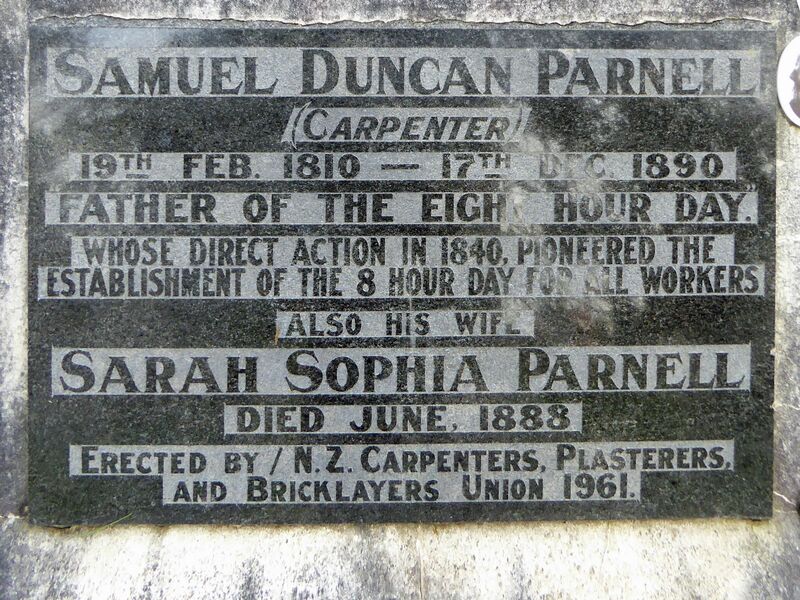 Other carpenters supported his demands and the eight-hour day was born. 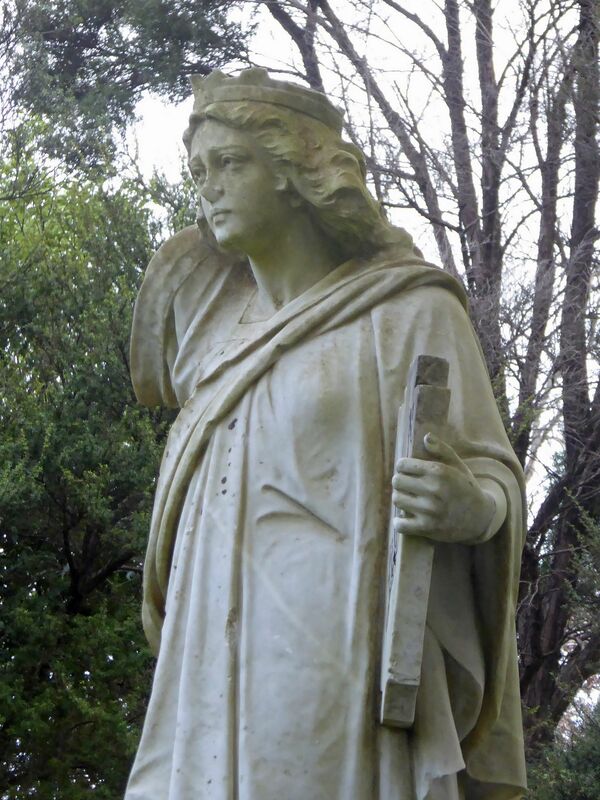 Gwendoline was the baby sister of New Zealand author Katherine Mansfield. The family grew up in Karori and Thorndon, and had a beach house in Days Bay. 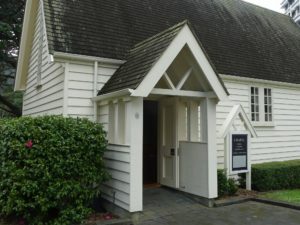 The Katherine Mansfield Birthplace museum, in nearby Tinakori Road, is open to the public. 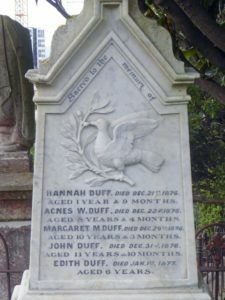 Five Duff children died tragically of diphtheria within 11 days. Note the recent memorials for well-known City Councillor Stewart Duff, who died in 1981, and his wife. 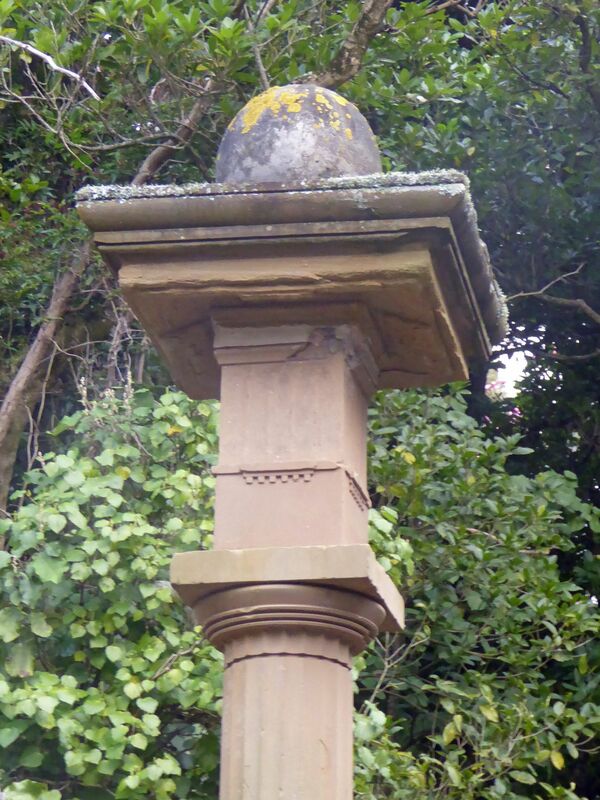 Ward was the first Primitive Methodist missionary to cross the equator, arriving here from England in 1844. 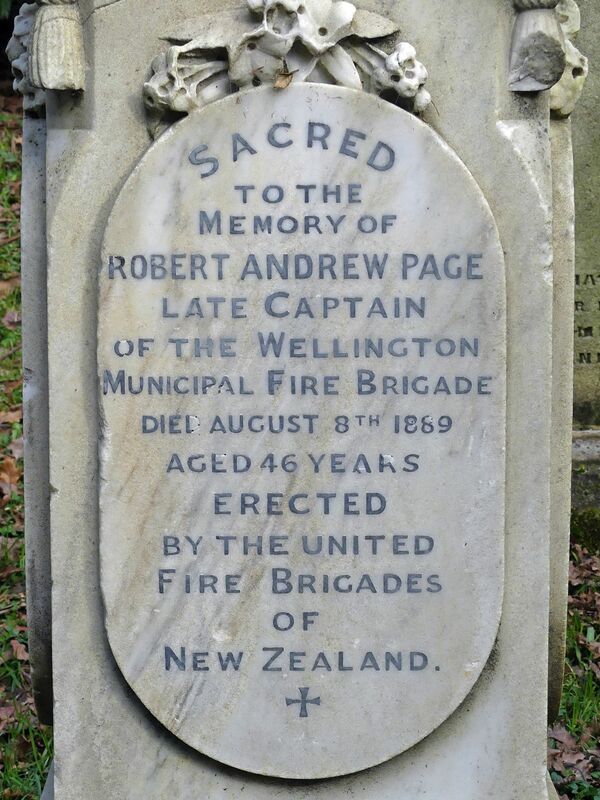 He worked in Taranaki, Auckland and Wellington. 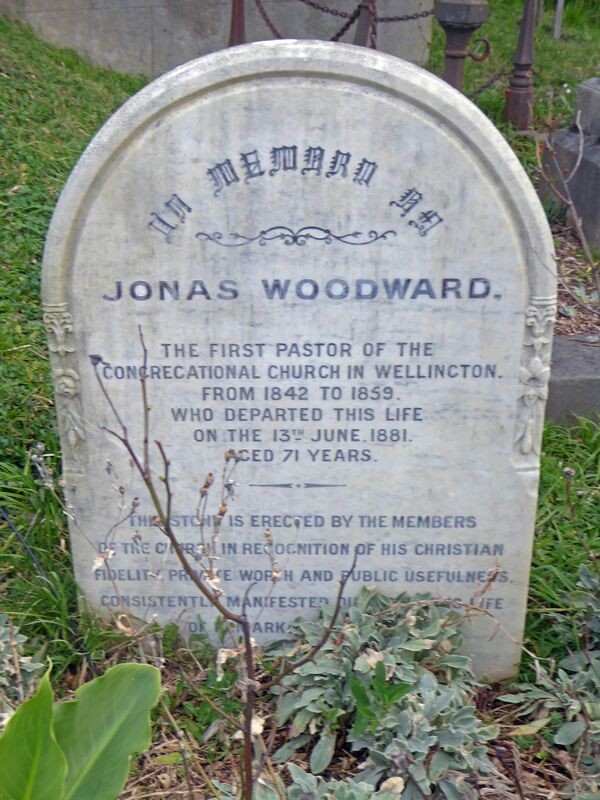 The former Ward Memorial Methodist Church in Northland, Wellington, was named after him. Either cross the footbridge to the Lower Trail or first take the circular Gully Trail by following Lyon Path down to the gully. 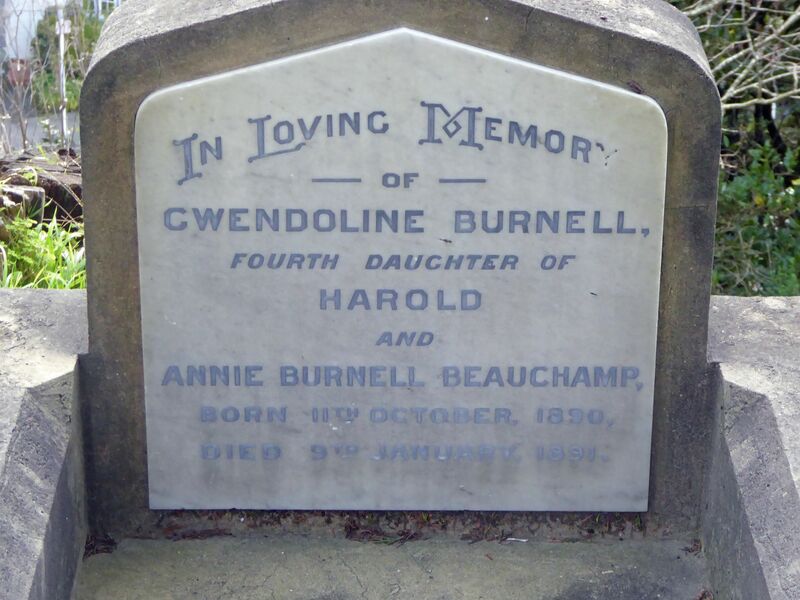 A printer from Dublin, Blundell founded Wellington’s first daily newspaper, the Evening Post, in 1865. 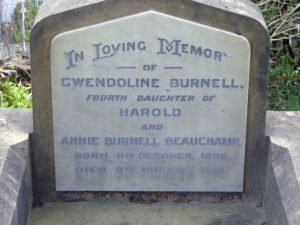 The Blundell family was associated with the paper for a century. 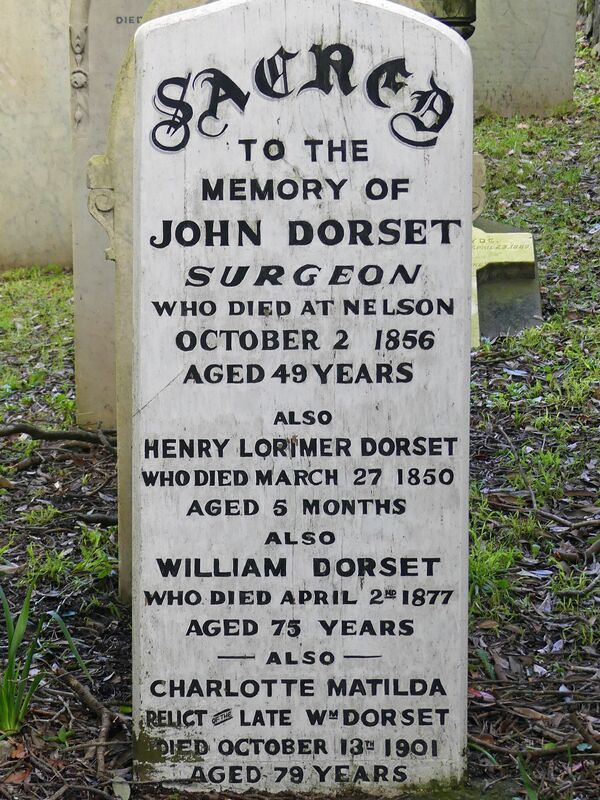 Its name lives on in the successor newspaper, the Capital’s Dominion Post. 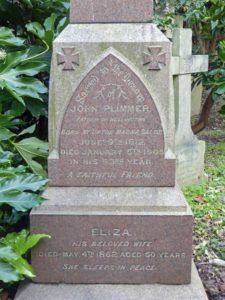 Plimmer was an energetic businessman, known particularly for “Plimmer’s Ark”, the wreck of the Inconstant which he used as a wharf and warehouse on Lambton foreshore. 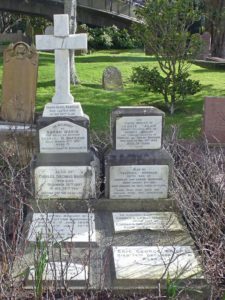 He was sometimes called “the father of Wellington” because of the many buildings he constructed and his powerful lobbying for land reclamation, railways and improved harbour facilities. 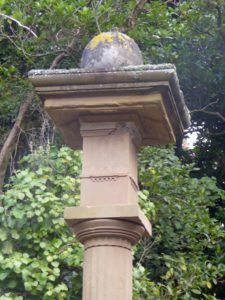 This elegant Masonic memorial was erected for Tucker, captain of the trading barque Camille, by his long-term employer Stafford. 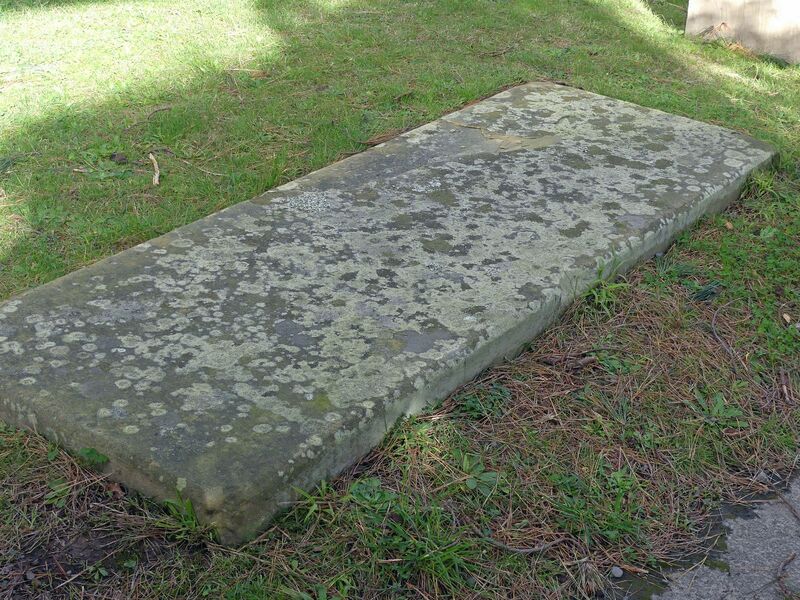 When Stafford died, he too was buried here. 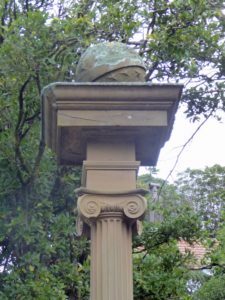 The solid stone memorial was made in Newcastle, New South Wales. A Doric column (left) is topped with a terrestrial globe; an Ionic column (right) has a celestial globe. 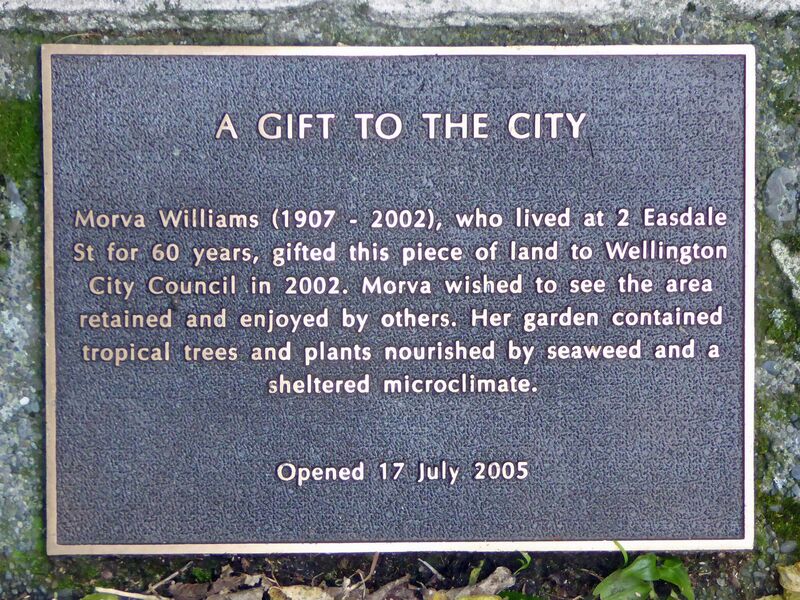 This area was bequeathed to the city in 2003 by Morva Williams, a conservationist. 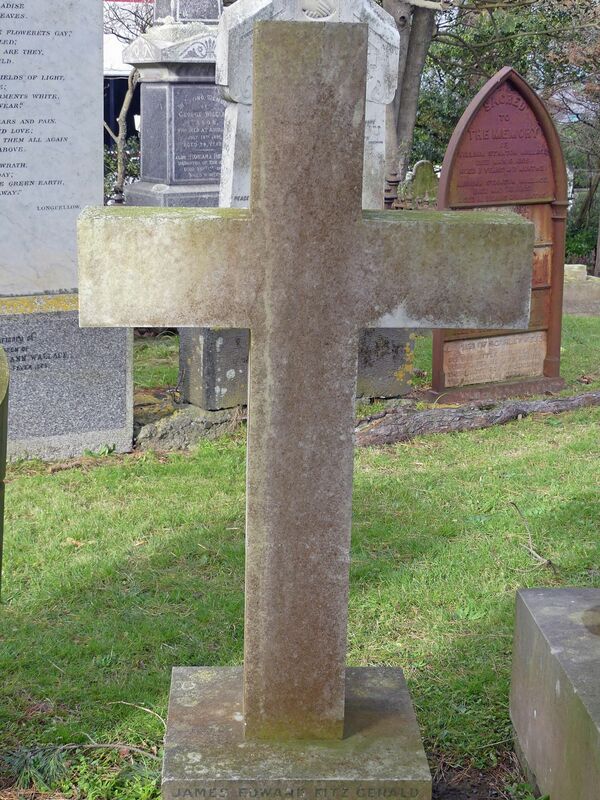 A chief of Te Ati Awa’s Pipitea Pa, he had been a warrior but converted to Christianity. He sided with the Government over a number of contentious issues and accompanied Governor George Grey to Taranaki in 1847. As you cross over the motorway you can see on the eastern side a grassed area that had been allocated for an on–ramp. It now incorporates memorial tree plantings for eminent environmentalists. 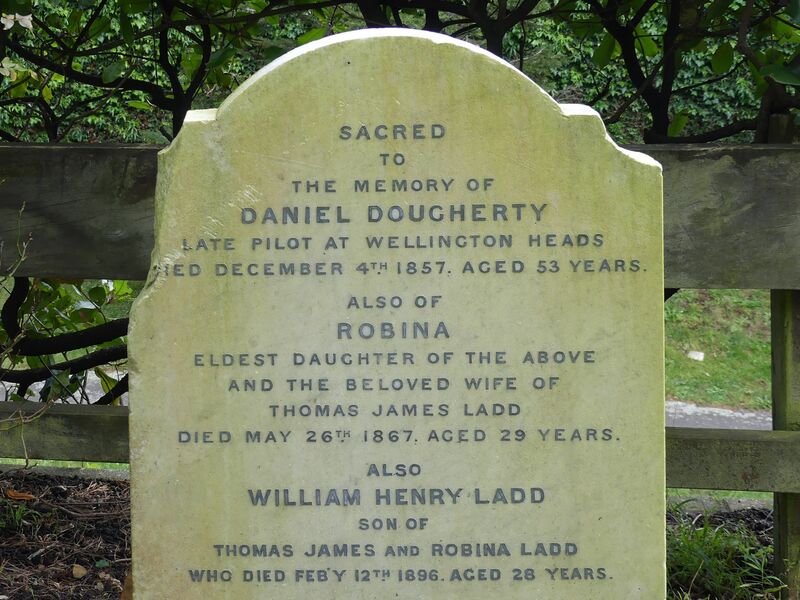 Daniel and Sarah came to New Zealand in a whaling ship in 1838. After a brief return to Canada and England, they settled in a whaling station at Port Underwood in 1842. 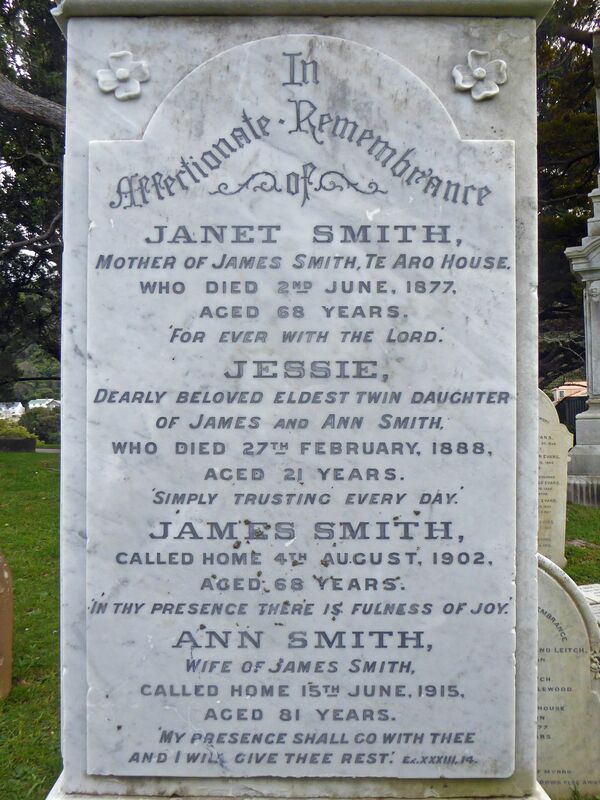 Sarah nursed the men injured during the Wairau Incident of 1843. 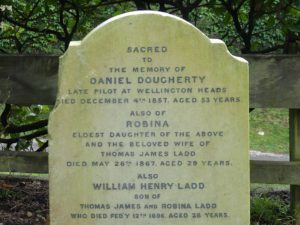 In 1849 Daniel and his pregnant wife crossed Cook Strait in an open whaleboat to take up the post of harbour pilot in Wellington. Later their home was destroyed by the 1855 earthquake. 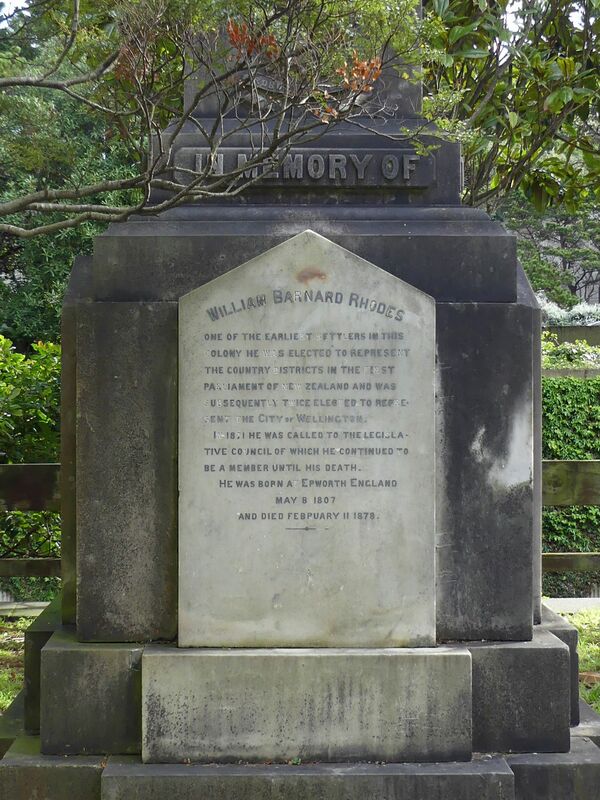 Rhodes, the oldest of four brothers who came to New Zealand, became a wealthy merchant, property owner and sheep farmer and a Member of Parliament from 1853 onwards. 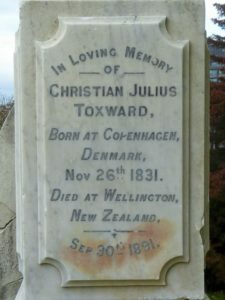 His tombstone, the largest in the cemetery, reflects the fact he was probably New Zealand’s richest individual at the time of his death. 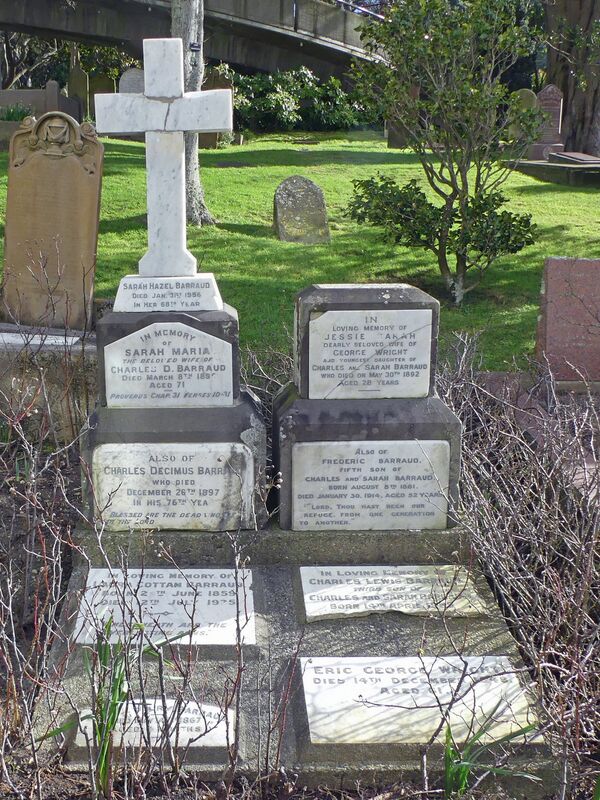 His grandson, William Barnard Rhodes-Moorhouse, was awarded a Victoria Cross in World War I. 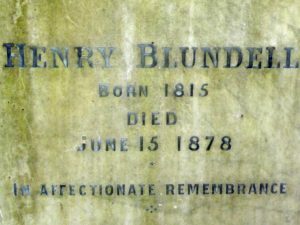 Superintendent of antiquities at the British Museum before emigrating in 1850, he became involved in New Zealand politics while editor and owner of The Press, and became superintendent of Canterbury Province. As MP for Lyttelton, he argued for Maori representation and became Minister of Native Affairs. 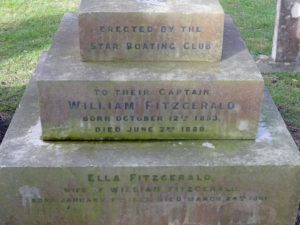 Alongside, note the memorial erected by the Star Boating Club. 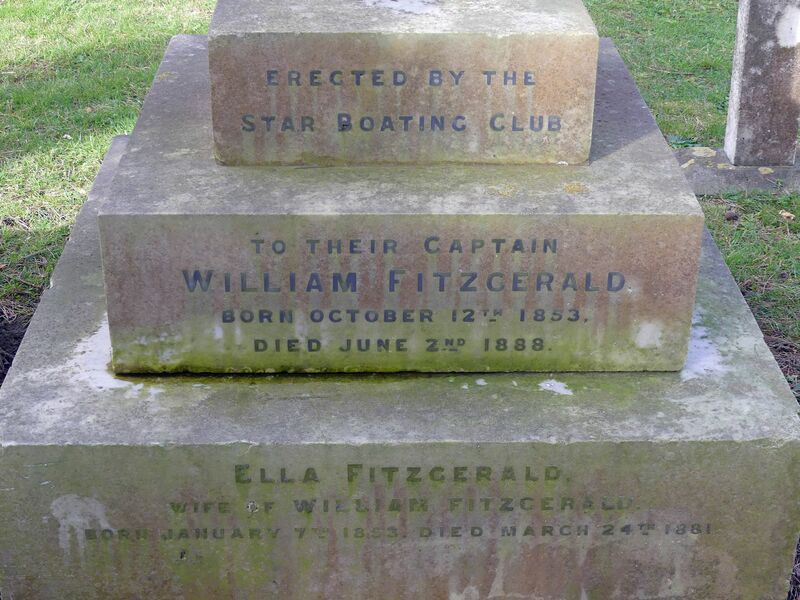 This was the first New Zealand rowing club, started by whalers in 1866. 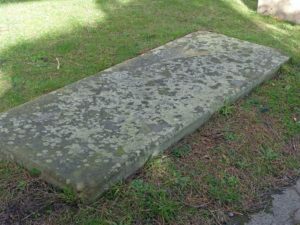 The flat stone slab marks the grave of the chief of Pipitea Pa, a signatory to the Treaty of Waitangi and uncle of the prophet Te Whiti. Five Wallace children died of scarlet fever in May 1865 and the sixth died three months later. Scarlet fever was then the most common cause of children’s deaths, causing blood poisoning and circulatory failure. 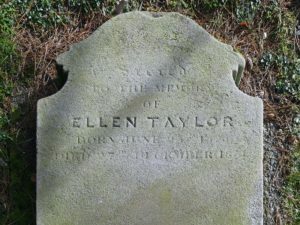 Ellen ran a shop in Wellington with her cousin Mary (later a noted English feminist and a friend of novelist Charlotte Brontë). Ellen’s cousin Waring Taylor (Mary’s brother) was a businessman who has a street named after him. 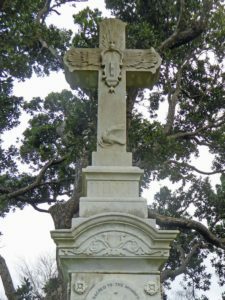 Edward Gibbon Wakefield created the New Zealand Company and assisted by his brothers founded settlements throughout the colony in the 1840s, including Wellington in 1840. 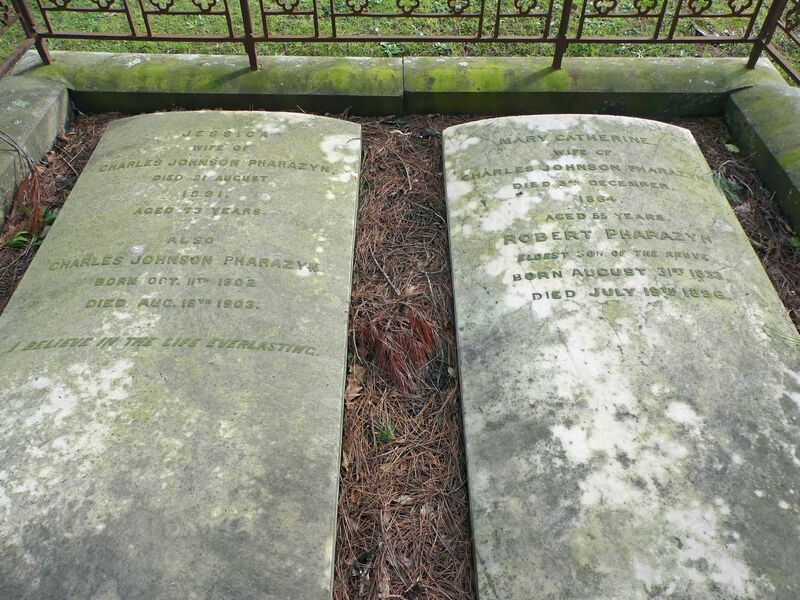 Visit the chapel for a detailed history of the Wakefield family and to see William Wakefield’s original headstone. 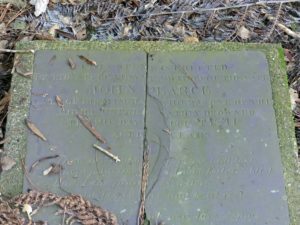 As you cross the grass to number 32, look for the faint line of bricks marking the boundary between the Church of England Cemetery and the Public Cemetery. 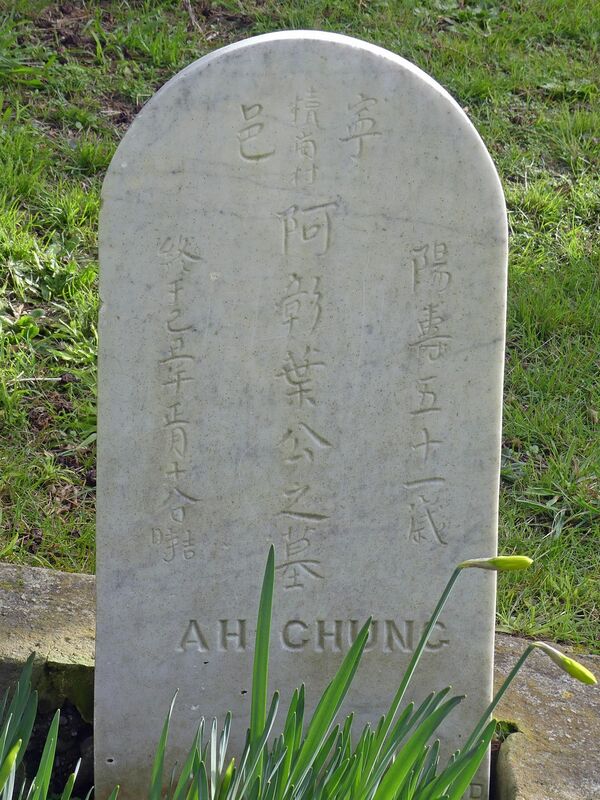 Three of the Chinese graves in the cemetery are believed to be those of seamen who became ill and died in Wellington. Each has a Chinese inscription naming his home village. 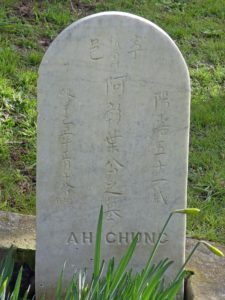 Mr Yip’s headstone reads: “Doak Gon village, Ling district, grave of Mr Ah Chung Yip, died in February 1889, aged 51”. 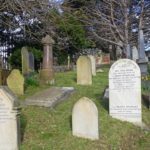 The Evening Post (19 February 1889) gave no information about Mr Yip, but reported that his funeral procession with 10 carriages of mourners (probably his crew mates) attracted “large numbers of spectators” to the cemetery. 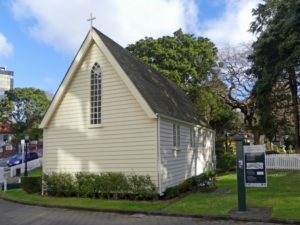 Turnbull, born in Wellington, left his library of 55,000 books and other items to the nation, and his collection became the Alexander Turnbull Library, now part of the National Library of New Zealand. 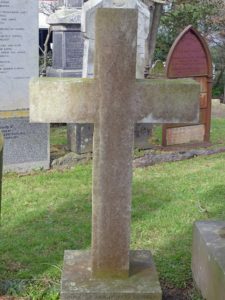 This is a relocated tombstone as the Turnbull family is now interred in the burial vault. 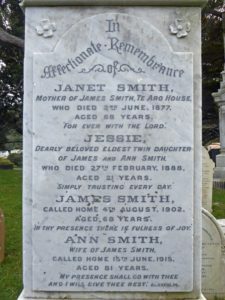 A printer and founding partner of the Independent newspaper in 1845, McKenzie later managed The New Zealand Times, established by Julius Vogel in 1874. At 13 Thomas unwittingly breached a tapu over a Maori house under construction. 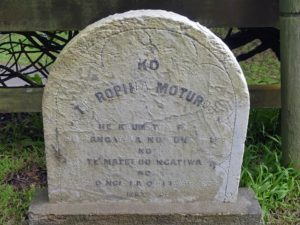 Chief Porutu would have killed him had his wife not thrown a cloak over the boy to prevent it. Barraud arrived in Wellington in 1849 and set up a successful pharmacy, later forming the Pharmaceutical Society of New Zealand. 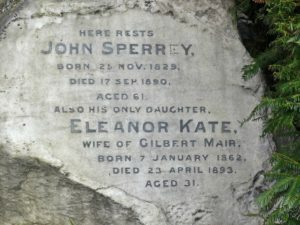 He went on to become a respected artist (watercolours and oils), highly regarded for his landscapes, and instrumental in founding the New Zealand Academy of Fine Arts. 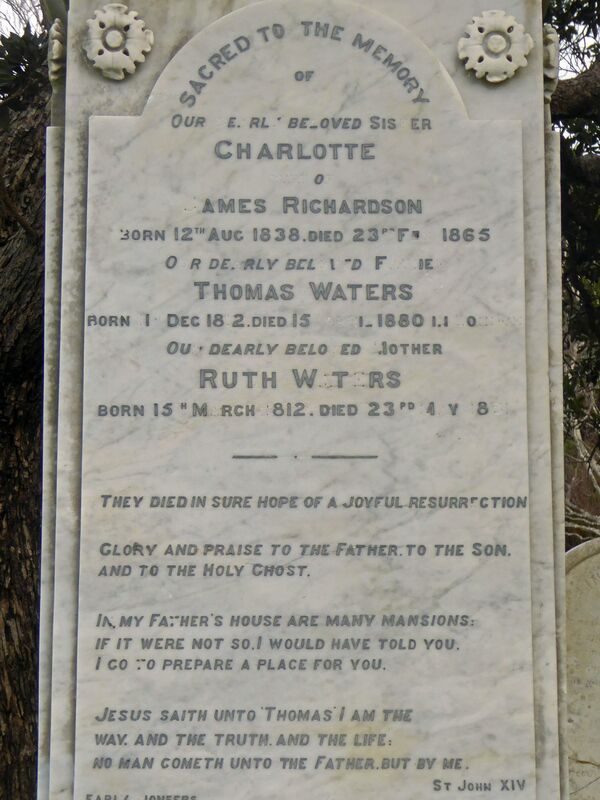 Charles died aged 101, having arrived in 1841. 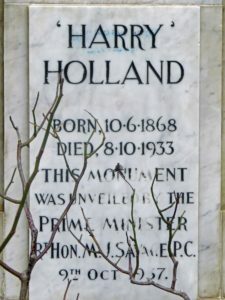 After running a store at Pipitea Point, he was a run-holder in Palliser Bay, and then returned to business and politics in Wellington. 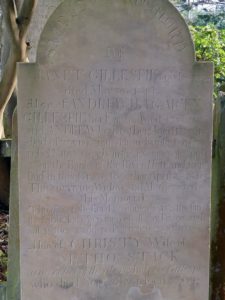 Jessica, his second wife, wrote several popular songs, set to music by Irish musician Michael Balfe (composer of the popular opera The Bohemian Girl). 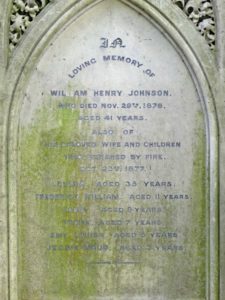 John was the baby son of Sir James Fergusson, Governor of New Zealand 1873–74, and his second wife. 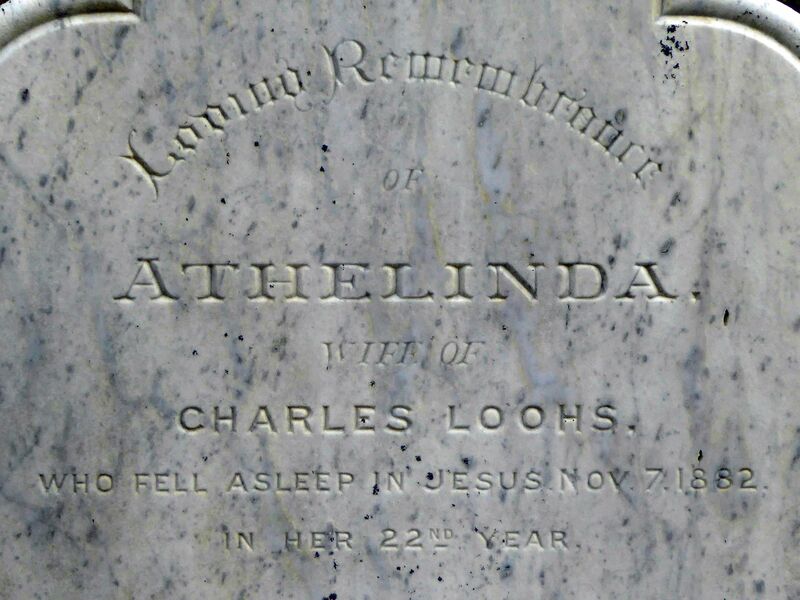 John died shortly after birth in 1873 and the little relocated coffin-shaped tombstone is simply marked with his first name and date. Sir James was the first of three Fergussons to occupy the vice-regal position. 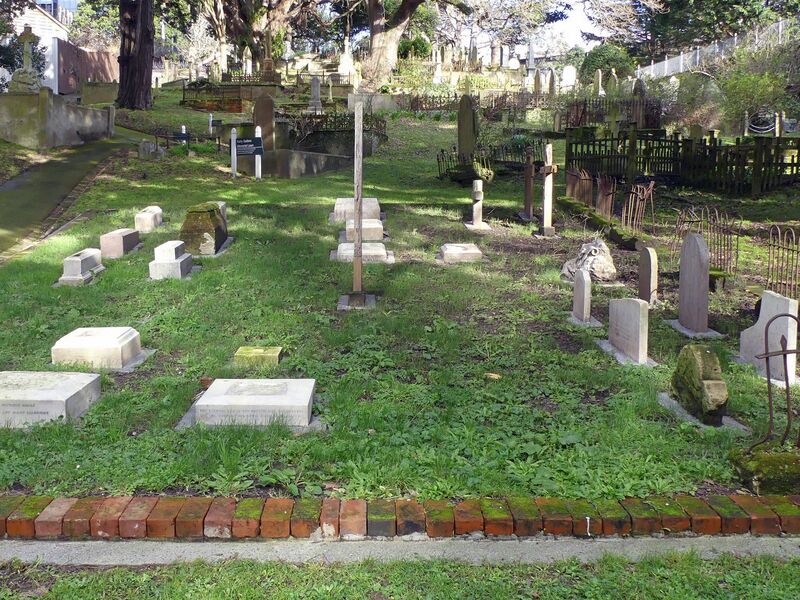 Beneath the Early Settlers Memorial Lawn outlined in bricks, is the vault for the bodies (about 3700) reinterred during motorway construction. 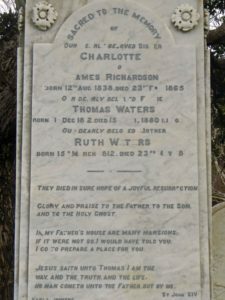 A list of names is located in the chapel . 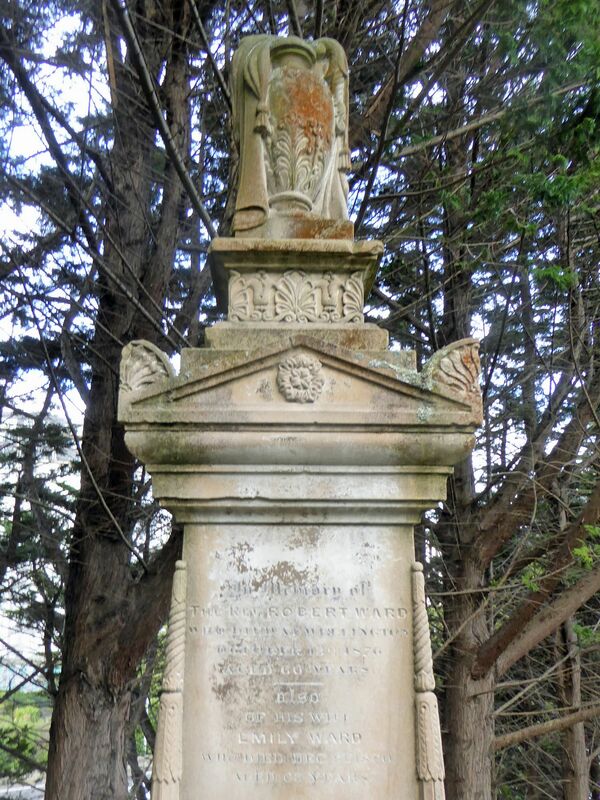 This may be the oldest memorial in the cemetery, probably erected in 1841. 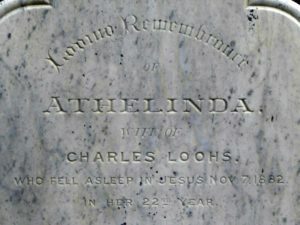 Several details on the tombstone are incorrect, including possibly the spelling of his name. 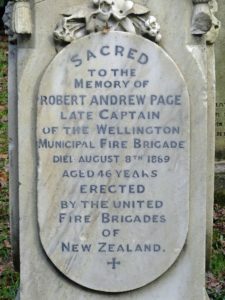 Pearce, with eight others, drowned when his boat capsized in a storm off Petone Beach on 25 August 1840. 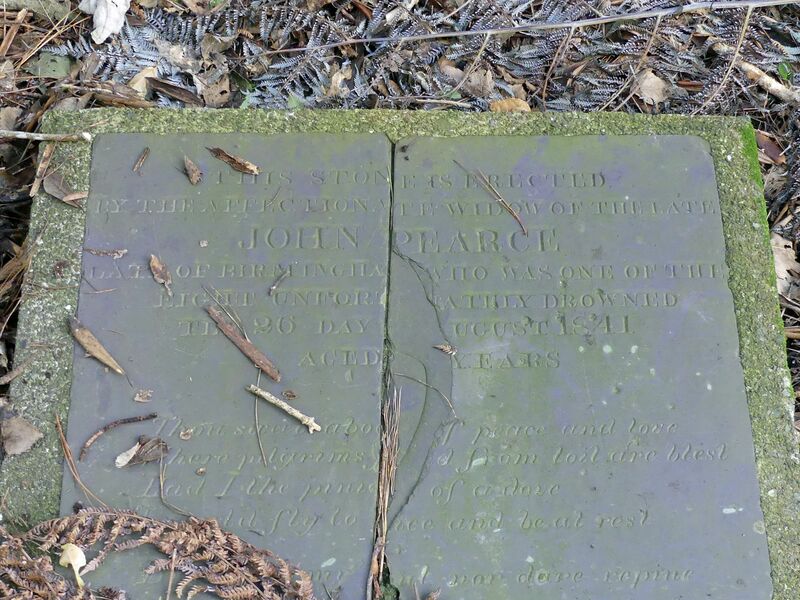 Ironically, Pearce had emigrated for the good of his health and had written letters for publication in London extolling the virtues of the area for settlement. 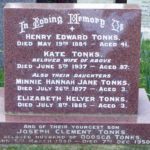 Louisa (a widow) and her five children were killed in a fire in 1877, which swept through three houses, stables and a hotel kitchen. Fire was a serious threat in the wooden settlement. Fire brigades were efficient, but this time a water blockage let them down. 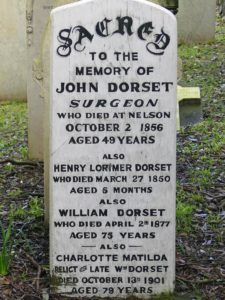 Dorset, a successful army captain, was appointed Colonial Surgeon and arrived in Wellington with Colonel Wakefield on the Tory in 1839. 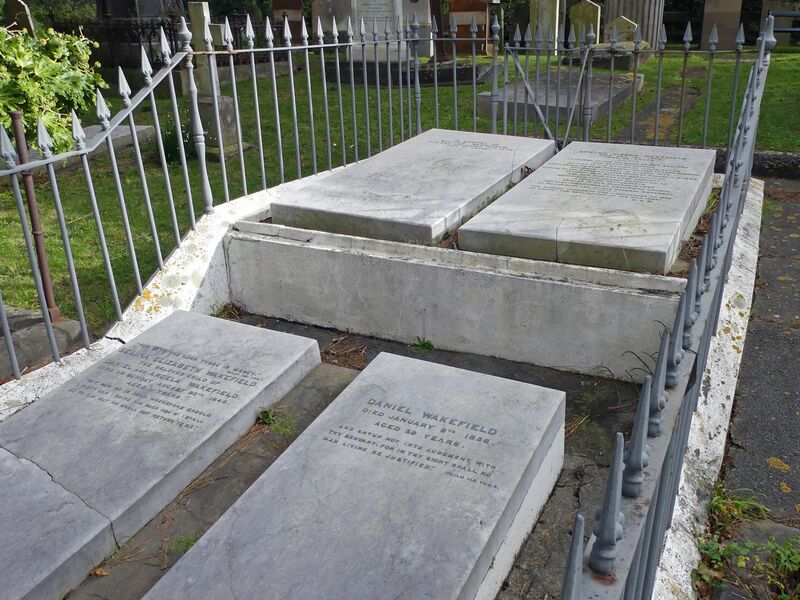 Prominent in colonial affairs, he owned several central city properties. 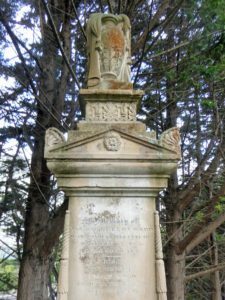 Point Dorset, Seatoun, was named after him. 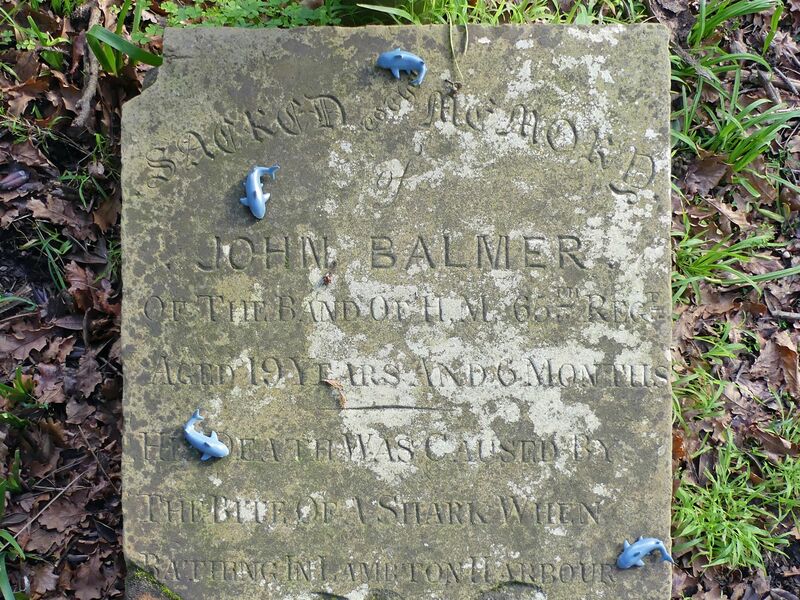 This is one of 28 wooden grave markers still surviving. 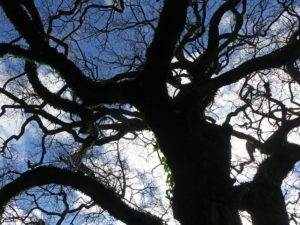 This tree is believed to have been planted by Bishop Selwyn, New Zealand’s first Anglican Bishop, perhaps as early as 1842. 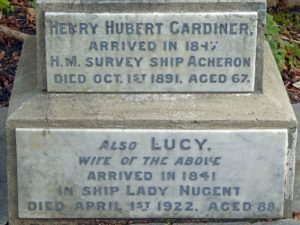 To the north is the grave of Archdeacon FANCOURT, first vicar of St Mary’s Church in Karori. 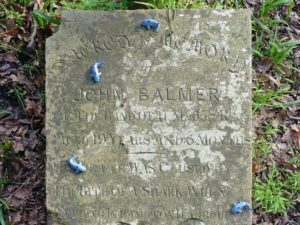 This bandsman of the 65th Regiment, a keen ocean swimmer, died in the jaws of a 4-metre shark in Lambton Harbour on Wellington Anniversary Day 1852. 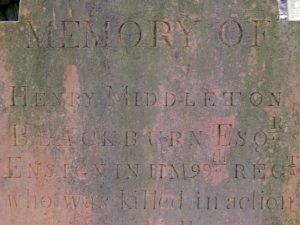 Recently someone has decorated the memorial with little blue sharks…it’s not clear whether they mean this respectfully or as a kind of sick joke. 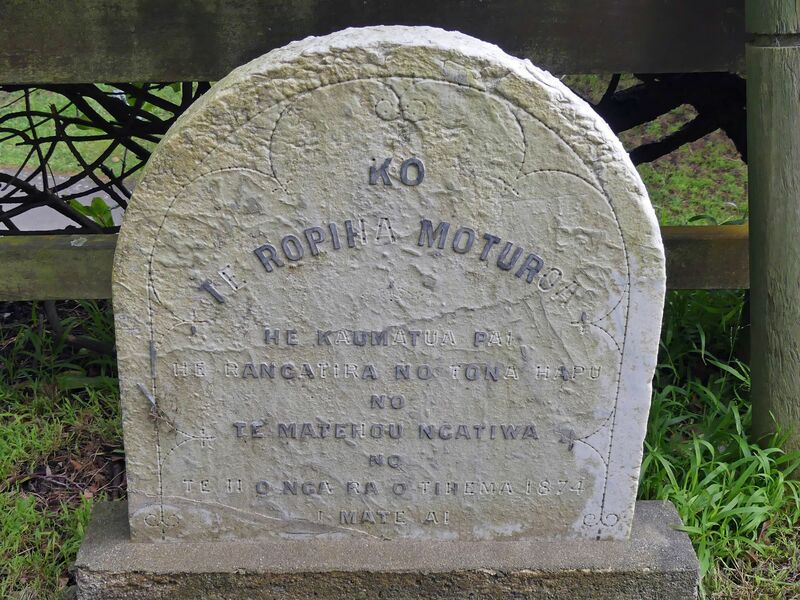 Father and son died in a revenge attack by tenants of Te Rangihaeata, after the burning of what they thought were derelict Maori huts on their newly acquired land in Hutt Valley. Te Rauparaha, anxious to clear his own followers of blame, told Governor George Grey where to find the murderers, although they were never captured. 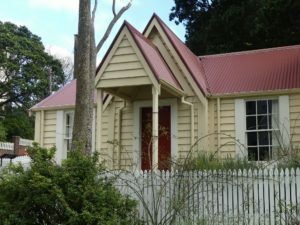 Built in 1857 by Charles Mills and soldiers of the 65th Regiment, this is one of the two oldest houses in Wellington. Now an artist-inresidence cottage, it is not usually open to the public. This is a replica of the original mortuary chapel, which was designed by Frederick Thatcher and built in 1866 using some materials from the first St Paul’s Church of 1844. 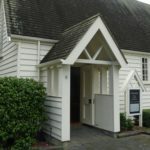 Now an information centre, it contains historical displays and a register of burials. Open every day, 10am–4pm. 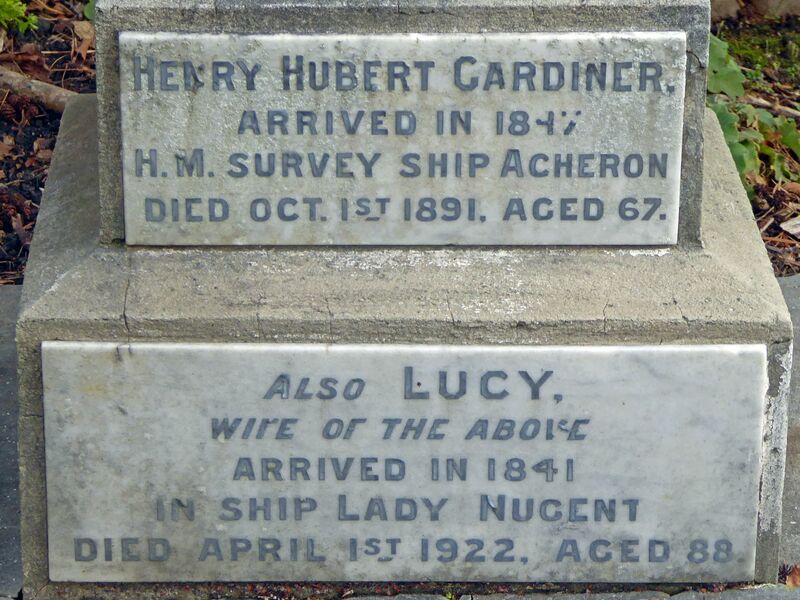 Lastly here are a couple of memorials that aren’t on the tour but whose names leapt out at me. I’ve never known the name Athelinda, and I’ve never known a Tonks; but I guess if you have a strange name you may as well make the most of it!